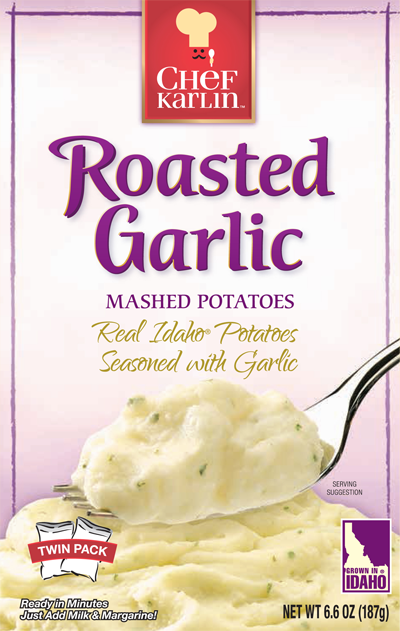 Ingredients: Potatoes*, Margarine (Partially Hydrogenated Soybean Oil, Salt, Nonfat Dry Milk, Mono– and Diglycerides, Natural Flavor, Soy Lecithin, Annatto Extract [color]) Salt, Corn Syrup Solids, Whey (from milk), Garlic*, Mono– and Diglycerides, Sodium Caseinate (from milk), Monosodium Glutamate, Dipotassium Phosphate, Parsley*, Natural and Artificial Flavor, Maltodextrin (from corn), Whey Protein Concentrate (from milk), Butter (Cream, Salt), Onion*, Caramel (color), Spice Extract, Turmeric Extract (color). (Freshness protected by Sodium Acid Pyrophosphate, Sodium Bisulfite, and Citric Acid). In a 2-quart saucepan, heat 1-½ cup hot water, ½-cup milk* and 2 tablespoons margarine or butter to boiling. *To avoid boil-over: delay adding milk and add milk with the seasoned potatoes (next step). In a microwave-safe bowl, stir 1-⅔ cup hot water, ½-cup milk and 2 tablespoons margarine or butter and one (1) pouch of seasoned potatoes until moistened.